Increasing restrictions imposed by Sudanese authorities have forced MSF to suspend most of its medical activities in the Jebel Si region of North Darfur State in Sudan. 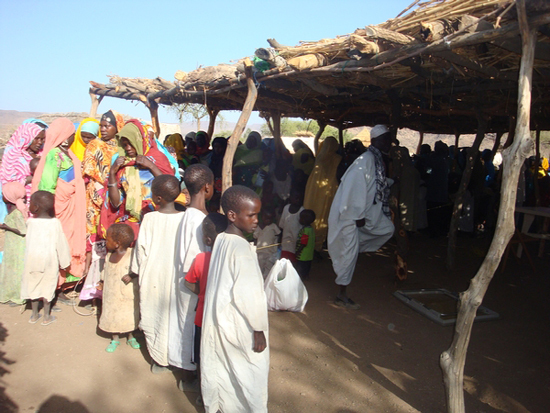 Mothers and children gather for an MSF vaccination campaign in Jebel Si, conducted in a local mosque. KHARTOUM/BARCELONA/NEW YORK, May 22, 2012—As a result of increasing restrictions imposed by Sudanese authorities, the international medical humanitarian organization Doctors Without Borders/Médecins Sans Frontières (MSF) has been forced to suspend most of its medical activities in the Jebel Si region of North Darfur State in Sudan. Increasing obstacles over the past year led to the suspension of MSF’s activities. No shipments of drugs or medical supplies have been authorized since September 2011, and MSF has encountered growing difficulties obtaining work and travel permits for its staff. Transport options to and from Jebel Si have also been drastically reduced. MSF has been the sole health provider in the region. Without medical supplies or sufficient staff, MSF cannot provide outpatient or inpatient consultations, or maintain its vaccination program, which was forced to close. For women with complicated deliveries, lifesaving Caesarean sections are no longer possible. Stocks of mosquito nets and delivery kits for pregnant women have run out, as have nutritional supplies. MSF calls on the Government of Sudan to provide the support necessary for it to resume providing vital medical aid to the people of the region. MSF is currently only able to provide limited nutritional healthcare, antenatal consultations and health education. There are no local health services in the region, and no other international organizations provide medical assistance there. Read MSF’s briefing paper "Somebody Help"
With MSF staff no longer able to stabilize critically ill patients, they have no choice but to refer patients to the hospital in El Fasher, eight hours away. Insecurity in the area, as well as mountainous terrain and poor roads, makes the trip particularly hazardous, especially for women with emergency obstetric complications, who would have a poor chance of surviving the journey. Maternal mortality levels in the Jebel Si region are at critical levels, and outbreaks of preventable and treatable diseases such as meningitis and measles are common, along with malnutrition. Over the past two years, MSF treated 1,805 malnourished children under the age of five in the Kaguro area of Jebel Si. MSF began providing medical assistance in the Jebel Si region in 2005, through a single health post, and by 2008 was running a rural hospital in Kaguro and five health posts throughout the region. These are the only health facilities in the area, serving a permanent population of approximately 100,000 people, as well as about 10,000 seasonal nomads, all of whom are entirely dependent on MSF for health care and emergency assistance. MSF started working in Darfur in 1985, and has been providing medical care in the region continuously since 2004. Currently, MSF works in various locations in North Darfur, including Shangil Tobaya, Tawila, and Dar Zaghawa, as well as in Shaeria locality in South Darfur, providing a range of services including primary and secondary health care and emergency response.